Looking for a fresh salad pick? 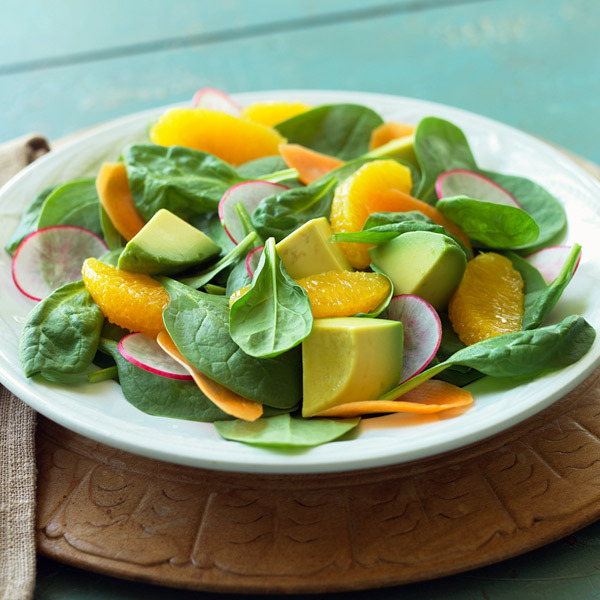 Try this deliciously different Avocado-Orange Salad. Made with Hass avocados, navel oranges, radishes, carrots and baby spinach, this colorful salad is like a fork-full of summer. Toss this easy avocado citrus salad with our Asian-inspired vinaigrette to meld the heart-healthy flavors. Cut thin slice of peel from bottom and top of each orange. Working with curve of fruit, cut off rest of peel and outer membranes. Working over strainer set in bowl, cut between orange segments to release them. Squeeze membranes to get juice. Measure out ¼ cup orange juice and transfer to large bowl. Whisk in vinegar, soy sauce, olive oil and sesame oil. Add radish slices, carrot, spinach, orange segments and avocado chunks, and toss to combine. Serve immediately.